Multi-use：it not only can be used as laptop desk, writing desk, Sketchpad, etc but also work as a standing desk lap desk on bed or sofa. You only need to adjust the legs to various positions to meet your needs.suitable on bed , sofa, lawn, and outside。It is essential for your home. Adjustable height：This laptop stand is very easy to adjust.3 knobs on each folding arm,Just need to press the button on the side of the stand， you can adjustable according to your needs. 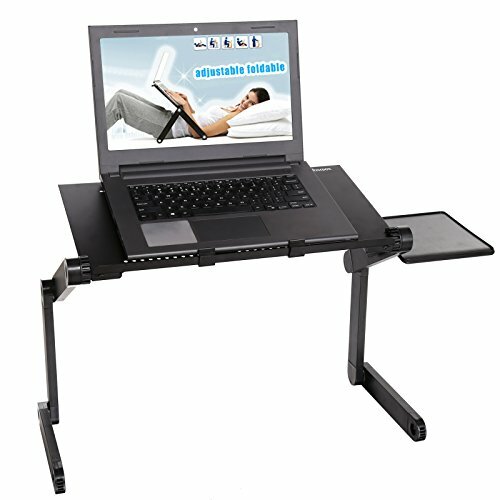 Sturdy and durable：Sturdy fully adjustable legs can rotate 360 Degrees and can be adjusted in different angles and make your computerfirm and steady. Saveing space ：Collapsible frame for easy storage and portability ，You can put it in any corner of your home without worrying about occupying any space at all. Comfortable ：It is flexible and convenient，,360 degree rotation at various angles allow to enjoy the screen at any posture view without neck and shoulder stress.Relieve Your Neck Pain and Tension. If you have any questions about this product by Bluefringe, contact us by completing and submitting the form below. If you are looking for a specif part number, please include it with your message.